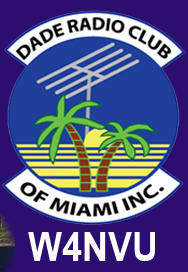 October 2013 Meeting Minutes – W4NVU – Dade Radio Club of Miami Inc.
Meeting was called to order at 19:33 with 34 present. We have a quorum. Miguel presided over the meeting and welcomed everyone. The meeting was not broadcast live on the air tonight from the EOC. There was testing being conducted in another room tonight. Everyone took turns and stated their name, call sign and what they did in Ham radio this past month. Miguel welcomed everyone again. Miguel reminded everyone present tonight to sign in. He also has a free book that he is going to give away to the next new Ham. Miguel announced that we were having a raffle tonight of a Yaesu hat, screw driver set and a head set. One ticket for $2.00 and 3 tickets for $4.00. Please see Esther. Treasurer – Esther advised that she has collected dues from two members for 2014. You can pay online thru pay pal. Any donations will also be accepted. Website – News Letter – Ryan is in testing. Julio advised that the club website has bee updated with the Hamboree and Maker Faire information. Robert explained Maker Faire. It’s a convention for people who like to make things. It will be good for the Hamboree. Miguel announced that we will be having a X-mas party in December. It will be the same night as our meeting night, December 2. The location TBA. We are looking for a venue. The 147.000 is up but not working. The 147.760 – Ray is not here tonight, but we are looking for a controller. The 220 is going up at Miami High and needs a new antenna. We also need access to UM. The 444.200 – Carl is working on it. The linking is only working one way. The Digipeater 144.390 is up and it works sometimes and sometimes not. Emergency Committee Chair – Carl announced that an SET was held on October 5. We sent our reports to ARRL. December 1 – Junior Orange Bowl Parade on Miracle Mile in Coral Gables. They need volunteers. Please see Philippe or go to the Coral Gables Races meeting next month. Sunday, February 2 – MiamiMarathon. If you can volunteer please contact Ben Nemser. He also will be sending out another email shortly. Saturday, November 30, Hamfest in the Woods in Okeechobee, Florida. November 16 – Free Flea at UM parking lot. Miguel asked Julio to post all of these events with a link on our website. Armando advised that there is a Tech class going on. The last session is this Saturday, October 19 here at the EOC. Testing will take place at 1 PM. The next class in December TBA. Jason advised that Multiple Sclerosis South Florida Chapter is holding the MS Bike Ride on March 1 and 2. He needs Ham operators. He will be here at our next meeting to sign-up volunteers. See Jason if you can help. Ryan came in from testing. The website is updated and has the info for Hamboree. Dave announced that we have 5 new Techs and 1 General tonight. Eddie Berlot, Login Brauer, Zeiada Azeez; Justin Cobb and Ian Merkel passed their Tech and William Combs passed his General. Congratulations!!! Miguel gave the “ham Radio Licensing Manuel” to Ian Merkel who just passed his Tech. Miguel announced that the next Hamboree meeting will be next Monday at the EOC at 7 PM. Eddie Berlot put on a presentation on SDR (Software Defined Radio). He gave us the following websites: http://sdr.osmocom.org; http://rtlsdr.org; and www.reddit.com/r/rtlsdr. Great presentation. Thank you Hugo. Miguel auctioned the headset for $56.00 to Carl Herrera; the screw driver set to Glenn Davis; the Yaesu hat was a “no sale” and will be auctioned off at the next meeting. Joanne made a motion to adjourn, seconded by Ryan. The DRC meeting was adjourned at 20:39.